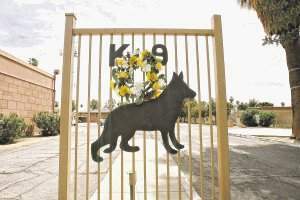 Ike, a dog serving in the Palm Springs Police Department, was shot in the line of duty this past weekend. Buddy found this article that salutes Ike and shares some insights into the lives of all the dogs that serve in K-9 units. Ike died doing what he loved and protecting those he loved. “He was the ultimate friend, an outstanding partner, a loyal member of his handler’s family, and in the end — a lifesaver,” read a statement from Palm Springs police. This entry was posted on Tuesday, April 19th, 2011 at 5:18 PM. It is filed under Blog. You can follow any responses to this entry through the RSS 2.0 feed.